This Home Theater Plates provide all the flexibility a professional installer or experienced do-it-yourselfer needs to create a sophisticated media environment. 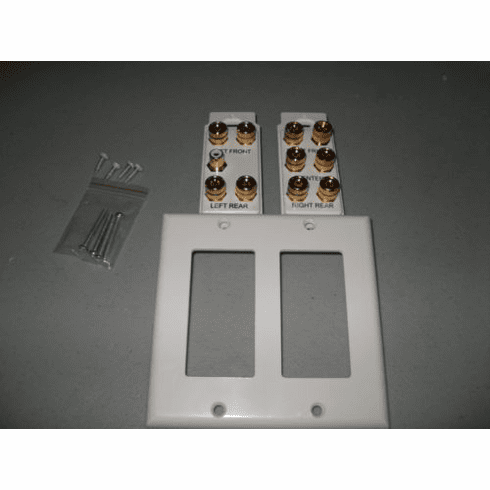 The plates are easy to terminate and contribute to a neat, finished installation. Clear labeling also simplifies room set up and configuration. Please Note: The subwoofer connection is an RCA connection on the front and an RCA connector on the back. Note: Not compatible with DUAL banana plugs. Works fine with individual single banana plugs. Includes 2-gang white plate with 5-pair binding post for front-left, front-right, rear-left, rear-right, and center speakers Includes 1 RCA jack for a subwoofer. Installs in a NEMA 2-gang box or low-voltage mounting bracket.